Norman Brown has sold over two-million albums and is a mainstay on the contemporary jazz charts. When the iconic and pioneering guitarist George Benson sings your praises you know you are a bad man! Benson has heralded the consummate hit-maker, Norman Brown, as one of the greatest guitarists around today. Like Benson, Brown effortlessly fuses the finer elements of jazz, R&B, pop and blues to create his own insatiable and instantly identifiable and soulful sound. Brown declares, "My blending and crossing of styles happens organically by allowing the content to reveal its elements. There are only two kinds of music - 'good and bad.'" Brown has made a career of churning out the 'good stuff' for over two decades. His unique elixir of urban contemporary jazz has allowed him to garner a devoted international following and an impressive career as a leader. He has also collaborated with the likes of Brian McKnight, Kirk Whalum, Miki Howard, Gerald Albright, Rick Braun, Dave Koz, Everette Harp andChanté Moore, to name a few. JazzTimes Magazine touts, "Norman Brown is the culmination of Jimi Hendrix and George Benson with some Wes Montgomery thrown in." 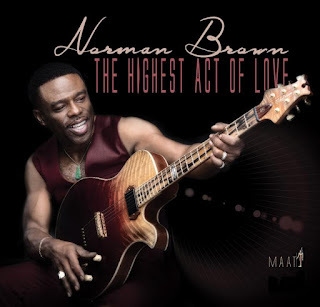 The Highest Act Of Love, Norman Brown's latest CD, is due out on Shanachie Entertainment on February 22, 2019, and has something for everyone (whether an R&B fan or a Jazz aficionado). Highlights include a beautiful collaboration with R&B legend Deniece Williams on her signature song "Free"" (from her gold-certified This Is Niecy album) and the bluesy guitar duet "Inside The Garden Of Peace And Love" with Paul Brown. Norman Brown's inspired latest CD proves that he is at his best and that his musical offering is truly one of the highest acts of love!